Paule's education in Health Sciences (Diploma) and Biology (B.Sc.) prepared her for life-long learning and sharing in ecology, bird life, environmental chemicals and health, and now the visual arts. When she became extremely “sensitive” to chemicals, she developed expertise in environmental chemicals, their effects on children and adults, and safe alternatives. In 2005, Paule created the Saskatchewan Network for Alternatives to Pesticides (SNAP) and, as president, has persisted in educating the public and politicians. Through her Organic Gardening Classes and Organic Land Care Training for Municipal Officials or Transitioning Landscapers she shares her knowledge about healthy living and growing. In 2008, Paule Hjertaas was nominated as a Woman of Distinction by the YWCA Regina and again in 2010. 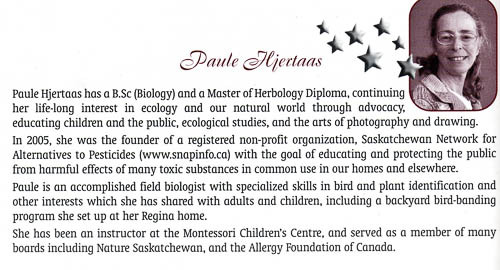 In 2010, Paule was honoured by the Saskatchewan Environmental Network with an Environmental Activist Award. In 2010, Paule was also nominated for the CBC Champions for Change. However, there seemed to be glitches as the nomination got there on time but Paule’s name was never put on the official list. As biologist, Paule has focused on birds and their vital importance in the ecology and in our human lives. Pouring over research and reports, writing for various media, talking with people in conferences and EcoFairs, she spread her passion to preserve ecosystem and human health. Her new channel is visual art and photography, through which she supports environmental and conservation organizations.